You and your family are invited to the 4th annual SMART 5.29K Run/Walk on Saturday, May 19, 2018! The SMART 5.29K raises money to establish SMART529 College Savings Plans for children recently adopted out of the foster care system in West Virginia. 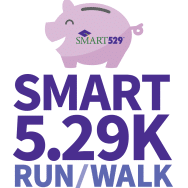 All proceeds from the 5.29K registration, minus a $3.00 race fee, will be deposited into SMART529 College Savings Accounts. The accounts will be awarded through a selection process administered by Frameworks and Mission West Virginia. This year’s race will be on Saturday, May 19, 2018, starting and finishing at the Appalachian Power Park (3rd Base Entrance on Smith Street). Check-In/Registration will begin at 8 a.m. A Kids Fun Run will take place at 8:45 a.m. for children 12 and under, and the 5.29K run/walk begins at 9 a.m. Packet Pickup is 4 p.m. to 6 p.m. on Friday, May 18, 2018 at center court of the Capitol Market on Smith Street. **Register by April 20 to be guaranteed a race t-shirt. After April 20, t-shirts will be available on a first come/first serve basis while supplies last.